It’s the GOLDEN BALL! Literally it’s a ball that’s gold. STOP! Collaborate and read it! The Soccer List is back with a brand new edition! 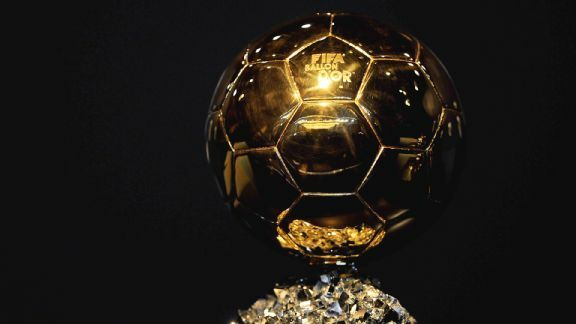 Now if you’re like me, and I’ll be honest I can only hope you aren’t for your sake, you have spent most of your week analyzing, nay, over analyzing Monday’s FIFA Ballon D’Or ceremonies, as I like to call it the FIFA Golden Ball ceremony on account of it sounding utterly ridiculous. So, sit back and relax as I dive into the Golden Ball ceremony and take aim at some of the things which caught my eye as I was watching the ceremony on the YouTube, also keep your eyes peeled for a serious question which I ask. In an effort to make the Golden Ball awards unwatchable FIFA have hired these two to host in perpetuity. If there’s one thing FIFA know how to do it’s how to drag legendary footballers out from under rocks and stick them beside Brazilian models and then prey that somehow they’ll magically have banter and hosting pedigree. Once again your hosts this year were former dreadlock wearing and dodgy mustache sporting Ruud Gullit occupying the legendary footballer role, and Brazilian actress and model Fernanda Lima occupying the, errr, Brazilian model role. Those of you who missed out on the ceremony, missed out on some great interplay between the two hosts such as an awkward pause followed by “Ruud, it appears you’ve found a famous Real Madrid supporter with a question for Sergio Ramos.” Honestly I’ve seen better back and forth at a middle school talent show where the emcee’s were students. The banter between Ruud and Fernanda was to be fair about as wooden as those shoes that the Dutch are famous for making. A suit so fine it’d make Sinatra look like a hobo? It seems the annual Golden Ball awards gala is when pint sized Barcelona maestro Lionel Messi chooses to give us a glimpse into his fun fashionista side. A couple of years ago he showed up to accept his trophy wearing what can only be described as a velour smoking jacket; and of course who could forget last years polka dotted tuxedo fiasco? I know I haven’t been able to, I still occasionally wake up screaming in the middle of the night thinking about the horrors of that choice of dress. 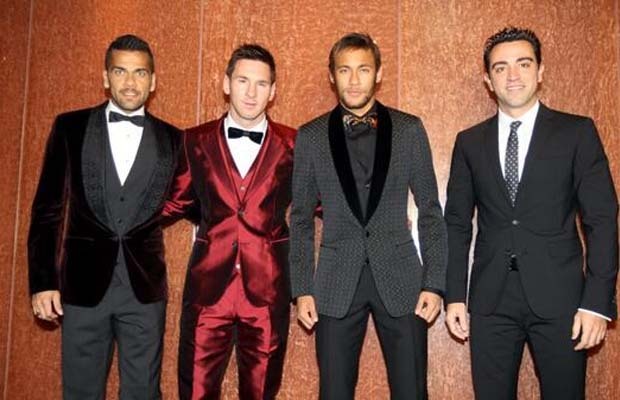 For this years gala, Messr Messi dialed back his suit, if only a wee bit. It seems as though he knew he wasn’t going to win the big gong so there was no reason to go stark, raving, mental with his suit. Instead, he found Ron Burgundy’s tailor and showed up in a suit which is more akin to legendary Vegas lounge lizard Tony Clifton than the second best footballer on the planet for the year 2013. Come on Leo, it’s a formal occasion, up your suit game! What will you do next year; sports coat, jeans, and high tops? Perish the thought! The Soccer List could never be described as a serious column. However, there was something which struck me as needing to be addressed while watching the awards Monday afternoon. FIFPro, are the organization representing ALL professional players around the world (so they’re essentially an international players union). On Monday they released the results of the FIFPro World XI and handed out some lovely mantle piece collectibles to the 11 players who were voted by their colleagues. Since the early 1990’s women’s soccer has been expanding globally at the rate of knots. There are professional women’s leagues in Asia, Australasia, Europe (UEFA has run a Women’s Champions League since 2001), and of course the United States is on it’s third incarnation of a professional women’s league with the NWSL. As all of the players in these leagues are playing professionally they fall under the FIFPro umbrella. So you’ll imagine how shocked I was to find that FIFPro the organization who represents these ladies when dealing with FIFA haven’t been bothered to come up with and facilitate the FIFPro Women’s World XI. Our game is a global game, it transcends borders, races, and genders; so what kind of a message is FIFPro sending when they can’t be arsed to promote the greatest players in the women’s game to the same level that they promote the greatest players in the men’s game? Surely it can’t be difficult to mirror the men’s voting process to give the top players in women’s soccer their due? The women’s game has never been more popular and it’s popularity continues to grow, so fans of the game, I encourage you to write to FIFPro, if you’re on twitter, send a tweet to @AndrewOrsatti (https://twitter.com/AndrewOrsatti) (FIFPro Director of Communications) asking “Why FIFPro doesn’t have a Women’s World XI?” and let them know that you want to see FIFPro recognize the women’s game the same way they do the men’s; because, the best players in the world deserve to get recognized regardless of gender and the money they bring in! 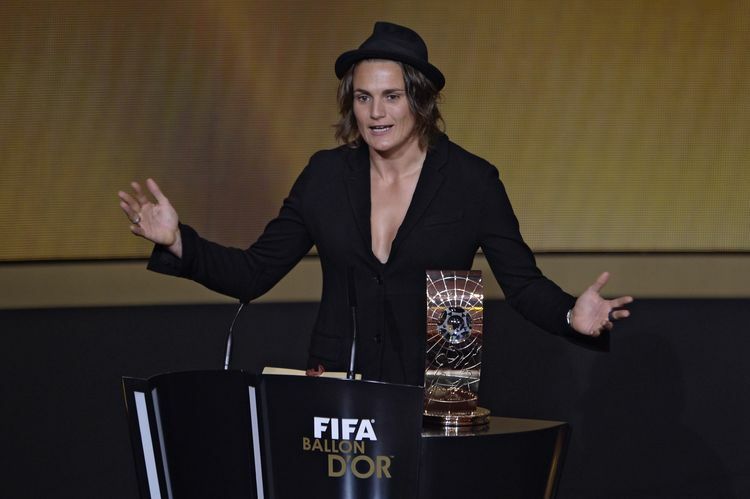 German goalkeeper and hat aficionado Nadine Angerer had a busy day Monday. A few days prior to the Ballon D’Or she announced that she would be playing in the National Womens Soccer League for the 2014 season, and that she’d announce the club she had signed with at the Ballon D’Or. The consensus among the women’s soccer community on twitter was that Angerer would be signing with 2013 NWSL Champions Portland Thorns, a consensus which was only heightened when Portland Thorns (and Timbers) owner Merritt Paulson sent a cryptic tweet about the Thorns having to say goodbye to a fan favourite, but bringing in an incredible replacement. So no one was surprised when shortly before the awards gala, Angerer and the Thorns both announced that indeed the 2013 European women’s player of the year would indeed be bringing her talents to Jeld-Wen Field for the 2014 NWSL campaign. Now, onto the award for Women’s Player of the Year. The nominees were Angerer, US Women’s team legend Abby Wambach, and Brazilian legend Marta. For those wondering their accomplishments in 2013, Angerer led the German side to the European title and was named European player of the year. Abby Wambach had by her standards a quiet year, despite establishing a new all time international goal record among either gender, she hardly set the NWSL alight and at 33 might be entering the late twilight of her career. This brings us to the third nominee Marta, who was one the shortlist pretty much because she’s won 5 of the awards before. She’s a fantastically skilled player but really hasn’t done anything to warrant inclusion on either the 2012 or 2013 PoY shortlists. Of course there was really only one choice for the winner, and it was indeed Angerer, frankly anything other than an Angerer win would have been ludicrous, as she was legitimately the best women’s player in the calendar year 2013. Loyal Soccer List readers (is there such a thing?) will know that I often poke fun at Real Madrid’s Numero 7. I call him the Puppet Ronnie based on a character in a fantastic satirical football short which used to air on Setanta Sports and the BBC. But the one thing I can’t do is say that he was undeserving of this years award. Some people might point to the fact that he didn’t win any trophies with his club this year like other finalists. But, that’s hogwash, the Golden Ball is strictly there to award to the best player in the world, period. In 2013, no one could touch the Puppet Ronnie, he scored more goals than he played games, he dragged a mediocre Portugal side kicking and screaming on his back to qualify for the 2014 World Cup, I mean he scored ALL FOUR GOALS in the most important game of the year for his country. If any player was worthy of being called ‘The Big I Am” this year it was the Puppet Ronnie. 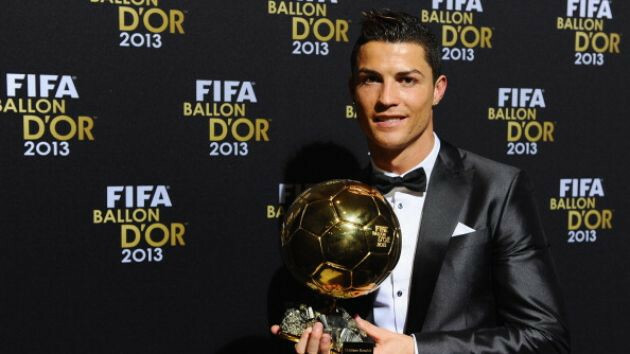 So congrats to him the 2013 Golden Ball winner. So that’s going to do it once again for The Soccer List, we’ll be back again within the next with with another look at the weird, wacky, and major stories of the football world.